The Healthy Food Pyramid – not set in stone! Written by Catherine Saxelby on Wednesday, 06 April 2016. 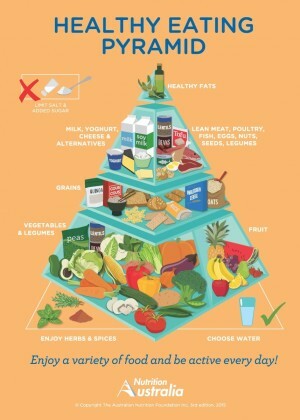 It’s been 15 years since the last version of the famous food Pyramid from Nutrition Australia. The 2015 version of the Pyramid helps cut through the confusion as well as helping combat fad diets. It’s consistent with 2013 evidence-based Australian Dietary Guidelines. Here’s my takes on what’s changed. They used to share a level of the old Pyramid with grains but now have the largest base layer of the Pyramid all to themselves. This means you should eat them in the biggest proportions in your diet by weight. Given their roles as nutrient providers, and the latest 'cheffie' fashion for vegetables taking a more central role on the plate, it’s clear that this move will definitely boost their profile. Fewer grains and more vegetables is clearly the message – and for the overweight, sedentary world that we belong to, it makes sense. It means fewer kilojoules, fewer carbs and more vitamins, minerals and phyto-chemicals. The graphic shows lots of vegetables and salads, especially leafy green vegetables, and lots of colour. I am reminded of that famous saying “Eat by the rainbow”. The message with vegetables is clear: get as many colours on your plate as you can from greens, to oranges, yellows, reds, purples, whites and browns. At the supermarket, it pays to shop around the edges where the fresh food is. Avoid the middle where the more processed foods are. 2. Grains are now in a layer on their own with the emphasis on whole grains over their refined white counterparts. “Mostly wholegrains” is now encouraged and a greater variety of grainy foods given including polenta, couscous, oats, quinoa and barley. No mention is made of the glycemic index of carbohydrates. This would have been helpful to ‘grade’ carbs in terms of their quality i.e. low GI carbs such as lentils and yoghurt are digested and absorbed more slowly helping you feel fuller for longer and preventing rapids peaks in blood glucose levels. They are the ‘healthier’ carbs to my way of thinking. So the take-home message is that carbs/grains are necessary, but in far smaller portions than portrayed in the old Pyramid. It appears that the message is to get your carbs from mostly vegetables (as they’re the least processed), rather than grains, which is not a bad strategy. One that is especially useful for an overweight person wanting to lose a little of that excess weight in today’s sedentary world. “Enjoy herbs and spices” gets a nice mention for the first time. This is because large quantities of fresh herbs such as basil, parsley and oregano are high in phyto-chemicals (some of which are antioxidants) and help provide flavour without the need for blood-pressure-raising salt - a good move. Healthy fats are included in the 2015 Pyramid, which is something I agree with as I believe that fats are an important constituent of any healthy diet. The focus, however, is now on ‘healthy’ fats with the image showcasing olive oil, where it used to also list margarine, other fats, sugar and ‘junk’ foods all in together. Healthy fats from oils, butter, avocado and the like have been demonised in the past but they are an important part of a healthy diet and are needed for salad dressings, vegetable toppers and spreads for wholegrain bread. I like the inclusion of Fats at the top of the Pyramid shown in small amounts. This is in contrast to the Eat for Health list of the Five food Groups which does NOT list Fats at all as one of their groups, which they did in the past. You’ll see the same five foods groups from the 1998 version i.e. vegetables, fruits, breads and cereals, dairy, lean meat, fish, chicken and other proteins. However the portion of the Pyramid they occupy has changed which means so should the proportion they occupy in your overall diet. Nutrition Australia want us to aim for ¾ of our daily intake as plant food. Water is still featured as a key beverage and one that should be more a part of our intake. The message is clear - drink plenty of water. It’s great to see water still as the main drink of choice. What is missing from this document is advice on how much fluids we each need to drink across the age groups and activity levels. There is also no advice on other healthy fluids such as tea or herbals. The overall message to “Eat a wide variety of nutritious foods everyday and Drink water” is the same as in 1998. The focus here is on reducing added sugars, not those naturally occurring (yet still wrongly accused) in fruit and milk. You can read more about the difference between them here. Eat less sugar and minimize your intake of refined, over-processed starches, and you will greatly reduce the need for your body to produce insulin. Overall the message of the new Pyramid is: Keep things as close to their natural state as possible. Processing is not all bad but fewer processed foods in your overall eating is something to aim for. Interestingly, there is less of a focus on being active than there was in the 2007 version where moving legs were underneath the whole base of the pyramid with the recommendation to “move more”. The pyramid is simplified, going back to its roots with the idea to educate people on a healthy way to eat. But don’t worry, physical activity is still firmly encouraged in the take away message at the bottom of the pyramid: “Enjoy a variety of food and be active every day!”. The level next to the top of the pyramid is reserved for all sources of protein – lean meats, fish, eggs, cheeses, milk and yoghurt as well as lentils, nuts and seeds. But here there is a divider between them, to provide clearer distinction between each food group. Eat slowly and stop eating as soon as you think you've had enough. There are two signals for feeling full - stomach stretching and release of hormones. Pay attention to them both. Limit or eliminate alcohol - it is empty kilojoules (Calories). Alcohol isn’t actually mentioned on the pyramid but I’d add it in as many people don’t realise it contributes a lot of extra kilojoules with virtually no vitamins or minerals. I think all food is OK in moderation. But the word ‘moderation’ is key. You can eat some grains, some fats, some proteins. Some processed food is also fine – it makes life easier and can have nutrition advantages. As one example, consider that you absorb more lycopene more easily from canned or cooked tomatoes than you do from fresh. Think of how much more you absorb from fermented sour dough breads than from flour. We should make use of the good processes that our grandparents and great-grandparents discovered and used. You can see the full history of the pyramid from back when it was first introduced in 1982 here.